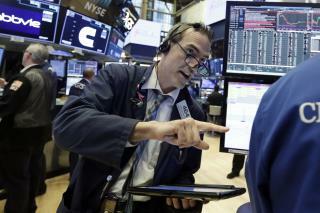 (Newser) – Stocks struggled to a mostly lower finish on Wall Street as losses for banks and energy stocks offset gains elsewhere in the market. The Dow Jones Industrial Average fell 74 points, or 0.3%, to 25,509, while the Nasdaq composite rose 3 points to 7,891, and the S&P 500 index fell 4 points to 2,853, per the AP. Among notable stocks, Bank of New York Mellon lost 1.6% Thursday and Chevron gave up 1.1%. Yelp jumped 26.7% after raising its revenue forecast, but Rite Aid slumped 11.5% after calling off its sale to the grocery chain Albertsons. Ok so it;s down Only -0.29% For tomorrow will be an UPTICK! & have a day on that note.